Arnitel is a high-performance ThermoPlastic Copolyester (TPC) that offers you a unique combination of flexibility, high temperature resistance and strength. Arnitel Eco is manufactured using renewable feedstock, in fact 50% of its content comes from renewable resources, and in particular, rapeseed oil instead of mineral oil. 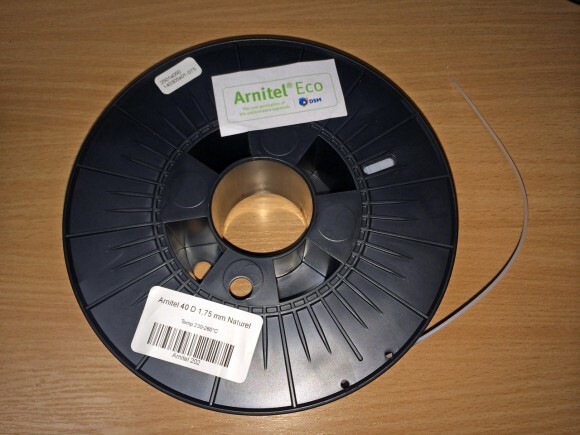 This elastic product outperforms conventional rubbers according to the manufacturer across a variety of applications, and is available in hardnesses ranging from 40 to 70 Shore D. The Arnitel Eco 3D printer filament can be used with any 3D printer that supports PLA filaments as you need to have an extruder temperature of about 230 degrees Celsius for the Arnitel when printing, the same as for PLA. As with other flexible filaments you may have trouble on some 3D printers that do not have filament feeding mechanism capable of properly using flexible filament, so you may need to upgrade or modify your filament feeded. The latest MakerBot Replicator 2 printers do not have problem using the Arnitel Eco flexible filament, though you may still get filament jams in the extruder if you are not using the proper printing settings. The rule that generally applies for using flexible filament is also in action here – use slower printing speed of about 1/3 of the normal speed you would use for standard PLA filament. So for example if using a Replicator 2 3D printer you will need to lower the parameter “Speed while Extruding” from 90 mm/s to about 30 mm/s. Depending on your 3D printer you may need to tweak a bit more the speed setting, especially if you are also printing small details where the movement of the extruder is not long enough to allow the cooling of the previous layer before applying the next one over.